The new year was ushered in with epic fashion for the Sullivan/Courtney pilgrims. We arrived in Nazareth at about 5pm, to find almost all the restaurants closing for the New Years Eve celebrations. We were not concerned because we had an enormous lunch in Ein Karem, and only planned on a light snack for our evening meal. Since we were all still stuffed from our lunch, I wasn’t even planning on eating dinner. At 7pm, I received a Facetime from a friend of ours who grew up in Israel but now lives in Omaha. He insisted that we join his family for their New Years Eve party. We reluctantly accepted (very reluctantly due to the knowledge that they would have an abundance of food and would want us to consume every morsel of the food they cooked). I explained our lunch earlier in the day and we were assured they would not have a big table full of food laid out when we arrived. 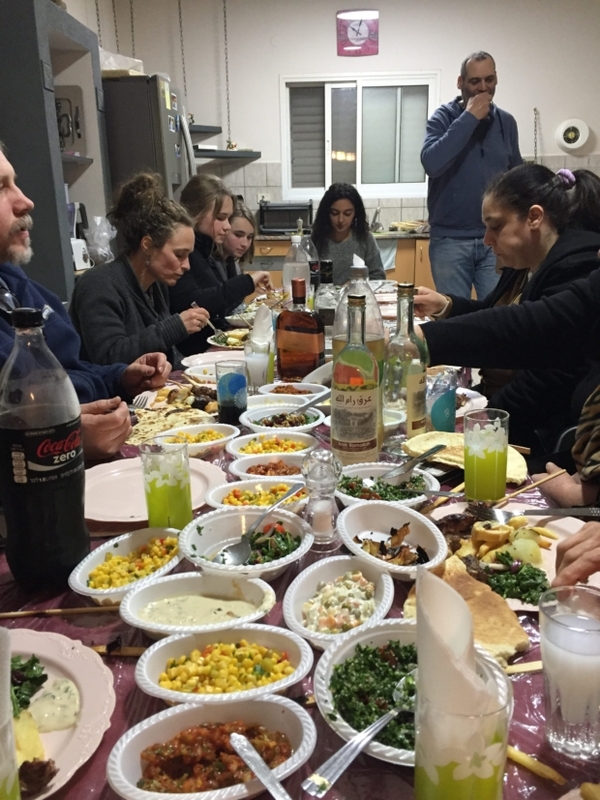 We arrived at their home (about 20 minutes outside of Nazareth) in Turan, to find a large family, a large table full of food and a grill, stoked and roasting lamb and other meats on shisks. Some of the family knew fairly good English and those who didn’t could get their stories across through the ones who did speak English. We were entertained with stories and were engaged in many conversations about local life, family experiences and other matters. Then came time to recline at table. The event we had feared, had arrived. For the next hour (possibly longer but I cannot confirm it due to coming in and out of a food coma), we dined on absolutely delicious salads, breads, hummus and other local delicacies including arok (the local version of ouzo), as well as the roasted meats. As soon as my plate hinted at an opening someone filled the vacancy with more meats. I finally had to lay on my plate to keep them from adding more food and they finally relented. Once it appeared as though the food train had halted, I relaxed a bit and we continued conversations with everyone in the family. 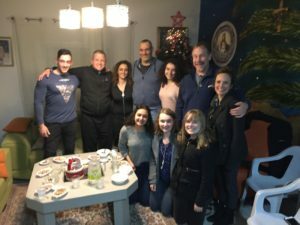 Then came time to retire to the living room once again and they brought out dessert, Arabic coffee and more wonderful conversation about a lifestyle totally unknown to us before the last few hours of 2017 drew to a close. My goal was to survive until midnight since it was clear that the family was going to usher in the New Year, in most generous form. Unfortunately for me, I’ve had trouble sleeping past 1:30 am since we landed 6 days ago. So by 11:30 I was not only stuffed to the gills with Mediterranean foods, I was consuming my last few fumes of energy as I had been awake for 22 hours. They brought out more desert, more coffee and more arok. As midnight arrived, the entire countryside erupted in fireworks and we sat, sharing stories and were entertained with traditional songs in Arabic by the eldest in the family. That’s when I noticed they were beginning to prepare more food but I could not tell what they were preparing. Later, I learned it was roasted chestnuts. I had consumed more food in one day than I have consumed in most weeks up to that point in my life, so I resolved to not place anymore food in my mouth before we got home. Thankfully, the coffee started to kick in, so I was fairly confident that I would get us back to our lodging without falling asleep. As the chestnuts roasted, the stories continued from 3 generations of the most wonderful people one could ever meet. In spite of no sleep for 24 hours, waaaayyyy too much food and being ½ way across the world, I felt like family (fat, sluggish and slightly disoriented family, but family). We finally mustered our strength to announce we absolutely had to get back to our rooms. They loaded us down with roasted chestnuts and then we gathered for prayer. The family prayed the Our Father in Arabic and we responded by singing the Our Father in English. 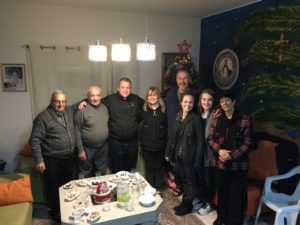 After embracing everyone in the family and taking some final pictures, we headed into the rain, back to our hostel in Nazareth as pilgrims more blessed than we had expected to be.